Alona Beach is one of the most beautiful beaches in the world. The mile-long beach has pure, white sand surrounded by rocky, limestone cliffs and wind-bent palm trees. There’s even a “house” reef just steps from the shore. So it’s not surprising that it’s one of the most popular spots on Panglao, if not in all of the Philippines. Dive centers and souvenir shops, seafood restaurants and sandy-floored bars line the beach. But you can escape the crowds—without giving up the view—at a boutique hotel. Amorita Resort sits atop the limestone cliffs. It overlooks the beach, the azure Bohol Sea, and all of the sparkling white boats that have come to play for the day. 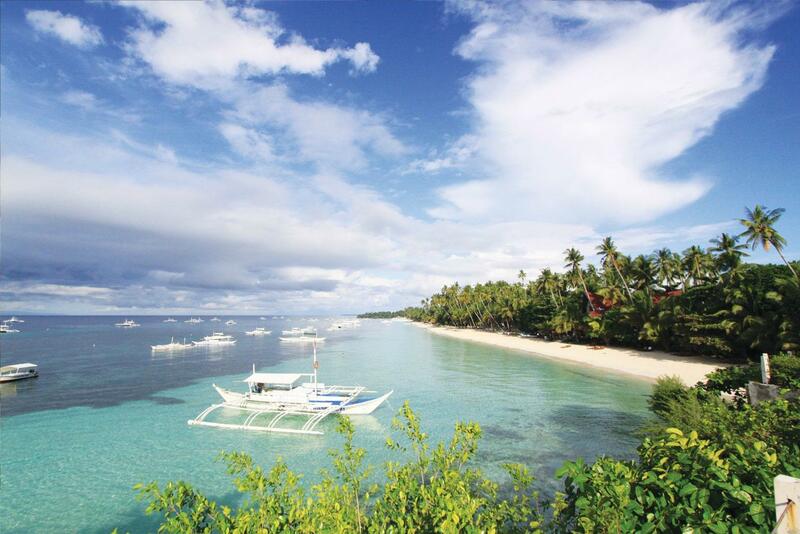 It has an ideal spot on the southern coast of Panglao. It’s the service at the resort that makes it the perfect place to stay, though. From the moment you arrive at Amorita, after a 40-minute drive from the airport, you know that you’ll be well cared for during your stay. After a toast with your welcome drink, you’re shown to your ocean villa. Clean lines and minimal decor ensure that your focus remains where it belongs: outside. Floor-to-ceiling glass opens to your private plunge pool and a pair of sun loungers. They overlook the shimmering blue water. 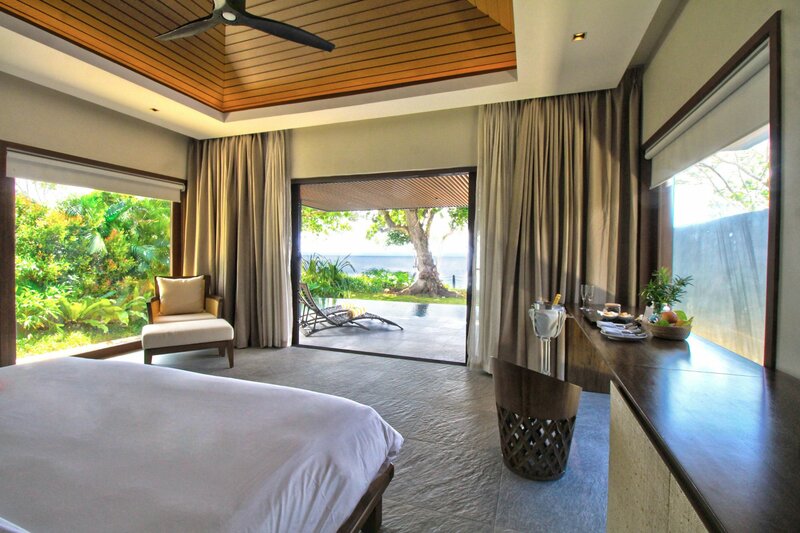 You can take in the whole view from your king-size bed. Plus there are drinks in the mini bar, cookies on the counter, and a beach bag ready to go. Two infinity pools and the cliff deck have similar views, as well. Any of them will be the perfect spot to watch the sun set. But you have a lot to do before it starts to get dark. Saffron Restaurant, at the edge of one of the pools, is your first stop. You want to try a Filipino speciality, tuna kilawin—think Mexican ceviche or Italian crudo—in the open-air dining room for lunch. A stop at Sea Explorers, the dive center, is next. Panglao seems like the place to finally take the certification course that’s been on your bucket list for years. Then it’s beach time. You consider kayaking or stand-up paddleboarding first. But once you reach the beach, you realize how happy you are that your feet are touching the soft sand. So you walk to the end of the beach along the edge of the water. Your eyes dart back and forth between the music on one side and the waves on the other. You scope out the restaurants and the bars to see which ones you eventually want to visit. While you watch the tour guides try to tempt passersbys with dolphins, whales, and private islands. By the time you return to the resort’s side of the beach, you’re ready to jump in the water. A manta ray immediately swims by as if to greet you. Alona Beach is just what you expected. It’s a gorgeous spot to enjoy the sand, the water, and the sun. And, if it gets a bit overwhelming, you can head up the hill to Amorita and your own plunge pool. In fact, a late-afternoon nap by the pool sounds great right now. Just don’t miss that epic sunset later.